Luke is lying unconscious in the rubble of the restaurant Stokes blew up as an act of revenge against him. While Misty Knight, other law enforcement, and the firefighters ponder whether there are any survivors or casualties from the explosion, Luke has a flashback to his life before he was virtually indestructible. Luke was a policeman named Carl Lucas that was sent to prison after being framed and convicted for a crime he didn't commit. At Seagate Prison, C.O. Albert Rackham is in charge. The private detention facility is also home to Shades, a fellow prisoner. This is also how he meets Reva Connors, who works there as a psychologist to the inmates and will later become Luke's wife (and Jessica Jones' plot device). Luke becomes friends with an inmate named Squabbles but is forced into an illegal series of ring fights run by Rackham after he fights off another inmate that had attacked him. Through this fighting ring, Luke encounters Shades. As Luke grows closer to Reva, he admits to her about the ongoings with the ring fights and they decide to work together to try to expose Rackham for these actions. When Luke admits of his plans to Squabbles, Luke loses his closest friend because Rackham tortures him to death for information. Desperate to keep his secrets, Rackham sends some inmates to beat Luke to death. Luke is barely alive when Reva brings him to Dr. Noah Burstein. Burstein has been conducting an illegal experiment on inmates under the terms that their participation will lead to time shaved off of their sentences. Reva is determined to save Luke from certain death but when Burstein is just beginning to put the procedure into effect, Rackham storms in and sabotages the equipment meant to save Luke. This interference causes an electrical surge and explosion of sorts and the results from this mishap is Luke gaining his virtually indestructible anatomy. 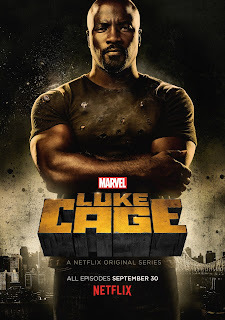 This newfound strength gives Luke the means to escape with Reva and this is when he takes up the new name "Luke Cage". They marry and start a new life together that leads into the events of Jessica Jones season 1. Returning to the present plot, Luke wakes and emerges from the rubble of the destroyed restaurant, having also rescued his landlady in the process. As the media is present to cover the explosion, Luke takes the opportunity to not only reveal his abilities but announce himself as Luke Cage.